We are always looking for ways to keep our Britts safe. We also know that these creatures are smart, and often times, one step ahead of us. Microchipping is important, but so is the information on their collar. Here is a good reminder from the folks at Gun Dog Supply. For Fosters and our own Brittanys, we highly recommend the 3/4 in. Day Glow Center Ring collar from Gun Dog Supply. It holds up under the toughest Brittany Testing Conditions and starts at only $4.99. I am always amazed at what some folks want on their dog's ID tags. We get some really interesting ones with information that really has no place on a dog tag. We will put anything you want on your ID plates, but keep in mind that the main purpose of an ID plate is to get your dog home safely if he gets lost. In our opinion, anything else has no place on a tag. Most folks that find your dog are going to want to call you. This means that including phone numbers is the most important thing you can do. I list every possible number that I have so that they will have multiple numbers to call in case I am not at my home phone. On my dog tags, I have my cell phone number, my house phone number, and multiple office numbers. That way no matter where I am or when my dog is found, there will be someone there to answer the call. Cell phone numbers are the best. After that, put your home, work, and any additional numbers that might help. Some examples would be your family, close friends, or hunting partners (anyone that might be around if your dog gets lost when you are not available). The next most important information would be YOUR name, not your dog's. Having your name on the tag will make it easier for the person calling to get the right person on the phone, especially if you list a work number. 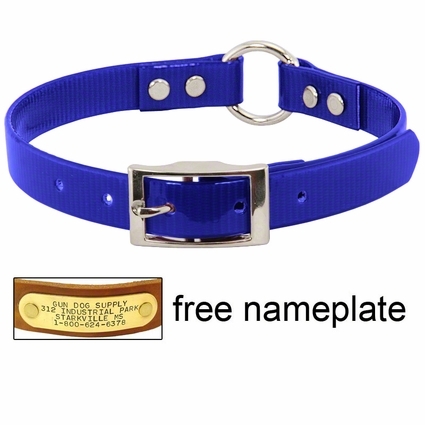 Having your dog's name on the tag does more harm than good. Many folks are not really aware of the number of dogs that get stolen every year. It's pretty high. Having your dog's name on the tag makes stealing your dog that much easier. It really doesn't do the dog any good, nor does it help anyone that finds your lost dog. If they get close enough to read the tag, then they can call the number on it. At that point you can tell them the dog's name if needed. For folks like me that travel, I also want the City and State listed. This way if I lose a dog in North Dakota and my tags say "Starkville, MS," the person that finds my dog knows that this dog is lost and a long way from home. After that, you can list your street address, but it is the least important line. Most folks are going to call. They may not have an easy way to get the dog back to you, and even if they do, they'll need to make sure you are home before they come over. We also use a few other things on our tags to help get our dogs back. "Needs Daily Meds" is one of my favorites. It adds a certain amount of urgency to getting the dog back home. If folks know that your dog needs medicine and that it's daily, they will be in more of a rush to locate you. "Reward if Found" is another good one. Just keep in mind if you put it on there, be ready to pay up when someone locates your dog. We have done this for years and the few times I have lost a dog, I could never get the person to take the reward. I did buy dinner one night for a couple of hunters that found my lost brittany named Maggie. Now you may be asking, "How do I get all this information on a 4 line tag?" Well, I can't, so I double tag my collars.